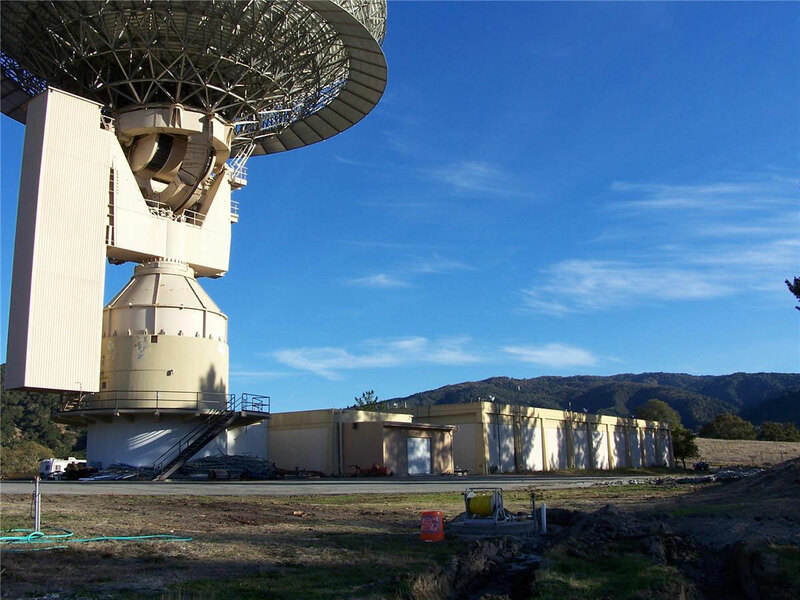 The Jamesburg Earth Station is located in the rural Cachagua area of Carmel Valley, California, about 26 miles (42 km) southeast of Monterey. It was originally built in 1968 to support the Apollo 11 moon landing. The 10-story high, 30 metres (98 ft) dish, driven by a Vertex-RSI 7210 drive system, served for about 35 years as the West Coast Teleport of AT&T/COMSAT's communications Satellite Network, and was the earth station serving Intelsat satellites parked in geosynchronous orbit over the Pacific Ocean. The dish played a role in capturing and distributing images of the Apollo 11 moon landing and the Tiananmen Square protests of 1989. The dish is housed in a 20,000 square foot building on a 160 acres (65 ha) site that has been subdivided for residential building. When fiber-optic undersea communication cables became economically competitive in 2002, AT&T shut down the site and sold the entire station with its facilities intact. For a time, it was operated by 11 ham radio operators who spent five months restoring the facility. They were eventually able to bounce 20 radio signals off the moon. In 2005, a new owner, intending to use the structure as a weekend home, stripped the interior and sold the contents as scrap, although the dish itself remains. The new owner decided to sell the property after his youngest son died of cancer. In January 2012, it was put up for sale for $2,950,000. In 2013, the Jamesburg Earth Station was leased by Lone Signal, an active SETI program, to send messages from the Earth to Gliese 526, a red dwarf star on the Catalog of Nearby Habitable Systems. ^ Dye, Lee (February 20, 1972). "By Satellite; Earth Station Jamesburg: It Shrinks World". Los Angeles Times. p. A1. Retrieved February 10, 2012. ^ a b "Jamesburg Earth Station". Retrieved November 3, 2011. ^ Madrigal, Alexis (February 6, 2012). "Earth Station: The Afterlife of Technology at the End of the World". The Atlantic Monthly. Retrieved February 10, 2012. ^ a b "Space History Buffs Try to Save Sat Dish". Aerospace Daily & Defense Report. March 12, 2007. Retrieved November 3, 2011. ^ a b Brown, Patricia Leigh (February 10, 2012). "Hello, Out There. Jamesburg Earth Station Is for Sale; 21,000 Square Feet of Cold War Memories for Sale, Satellite Dish Included". The New York Times. p. A12. Retrieved February 10, 2012. ^ "New Project Begins Beaming Your Messages Into Deep Space". Space.com. TechMediaNetworkk. 2013-04-17. Retrieved 2013-06-21. This page was last edited on 26 August 2018, at 09:05 (UTC).